I featured this product in a recent haul video on my YouTube channel which you can view HERE. However, now having used it a fair few times I thought I'd give some more in-depth views on it. 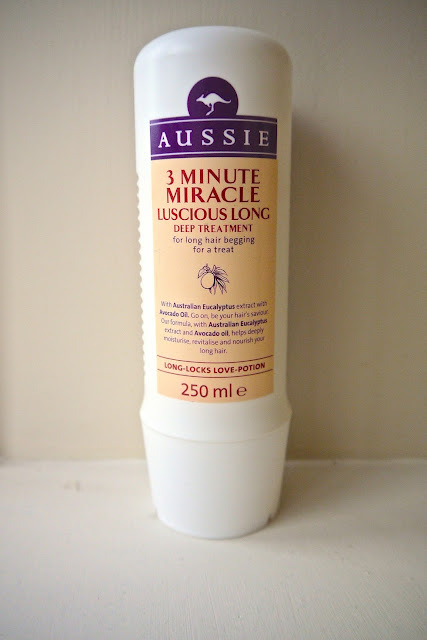 The Aussie 3 Minute Miracle conditioners are very hyped products and after using it I can see why. After 3 minutes of this, my hair feels nourished yet not at all weighed down like it sometimes does when I use my Moroccan Oil conditioner. This smells lovely, as all of the Aussie products I have tried do. These are very reasonably priced, but are a steal when bought as part of an offer. I don't use this every time I wash my hair, but every other time. This is for two reasons. One, because I have plenty of other conditioners to use up and two, because I don't want my hair getting used to have a 3 minute conditioning every time I shower. Even when using this product before I use my Aussie Miracle Leave-In Conditioner, it does not feel at all weighed down or greasy which is a major plus. The Aussie products have proven great for nourishing hair; particularly that is dry at the ends and can easily get greasy/flat at the roots.